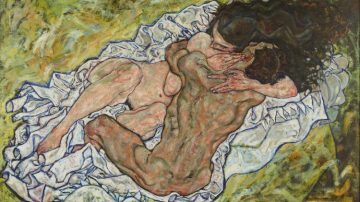 Beauty and the Abyss is the theme for exhibitions in Vienna in 2018 with works by Klimt, Schiele, Wagner, Moser and other Viennese Modernism artists. The topic of the year for many special art exhibitions and cultural events in Vienna in 2018 is Beauty and the Abyss (Schönheit und Abgrund) with the focus on artists, scientists, architects and other creative ideas that had an impact on Vienna in the years around 1900 and up to the end of the Austro-Hungarian Empire in 1918. Proponents of the Viennese Modernism will feature prominently with special emphasis on the four artists who died in 1918: Gustav Klimt, Egon Schiele, Otto Wagner and Koloman Moser. Advanced skip-the-line tickets are available online from Tiqets and other service providers. Tiqets tickets are usually accepted as mobile phone direct entry tickets while others may require a paper print out and collecting a ticket from the counter. The Vienna Pass includes admission to most of these museums too. Gustav Klimt (1862-1918) is arguably Austria’s most-famous and most-popular painter. 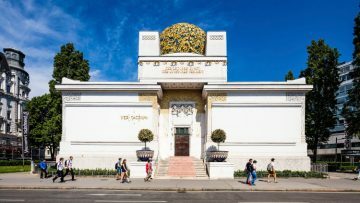 Many of his works, including The Kiss, is on permanent display in the Belvedere in Vienna with the Secession building, Leopold Museum, Albertina and KMH also good venues to see his work. Not a special exhibition but rather a bridge built in the stairway of the KMH to bring visitors closer to the cycle of 13 spandrel and intercolumnar paintings Klimt designed for the staircase of the museum. At other times a special Swarovski telescope allow visitors a more detailed look of these important early Klimt works. 13 February to 2 September 2018 in the Kunsthistorisches Museum Wien (KMH) – online tickets available from Tiqets. Klimt’s famous Nuda Veritas will be exhibited alongside other representations of self-perception. 6 February to 21 May 2018 in the Kunsthistorisches Museum Wien (KMH) – online tickets available from Tiqets. The end of the First World War, the dissolution of the Austro-Hungarian Empire, and the death of Klimt, Schiele, Wagner and Moser in 1918 is often seen as the end of an era. This exhibition of around 80 works shows how this cataclysmic year changed the art of the Danube Monarchy while some things remained essentially the same. 22 March to 26 August 2018 in the Lower Belvedere – online tickets available from Tiqets. A special exhibition co-curated by the Van Gogh Museum Amsterdam that will compare Klimt with contemporaries including Monet, Van Gogh and Whistler. Scheduled for the Lower Belvedere in 2019. Egon Schiele (1890-1918) is mostly famous for his stark portrayal of the naked human body in paintings and drawings. These works scandalized fin de siècle Vienna and are still unaccepted in outdoor advertisements. The Leopold Museum is home to the largest Egon Schiele collection with around 40 paintings and 180 other works on paper. The Belvedere also has a large collection of paintings. Paintings and graphic artworks of Egon Schiele will be displayed in dialogue with handwritten pieces and poems, documents, photos and other objects from his life. The Leopold will also exhibit a large selection of graphic works by Klimt and sheets by Koloman Moser. 23 February to 4 November 2018 in the Leopold Museum – online tickets available from Tiqets. A special exhibition that will show every oil painting of the Belvedere’s extensive collection of Egon Schiele works enhanced by sketches and related works by Schiele and his contemporaries. 19 October 2019 to 17 February 2019 in the Lower Belvedere (Unteres Belvedere) & Orangerie – online tickets available from Tiqets. Koloman Moser (1868-1918) was a co-founder of the Wiener Werkstätte and is often considered to have been the world’s first graphic designer. 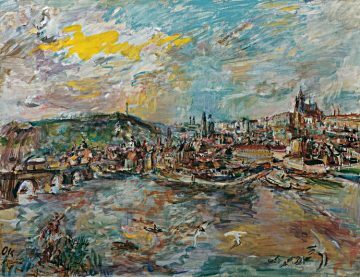 In Vienna, his works may often be seen at the MAK, Leopold Museum and the St Leopoldkirche. A special exhibition on the output of Koloman Moser from the archives of the Wiener Werkstätte. Moser was a painter, graphic artist and craftsman for this group that attempted to bring art into all areas of human existence. 19 December 2018 to 22 April 2019 in the MAK – Museum of Applied Arts / Contemporary Art. Moser’s Wreath Bearers frieze played a central part in the Secession’s architecture with his dancing girls providing a contrast to the gilt laurels of the dome. Some lost plaster reliefs will be recreated for the exhibition while Klimt’s Beethoven Frieze is on permanent display. March to October 2018, Wiener Secession. 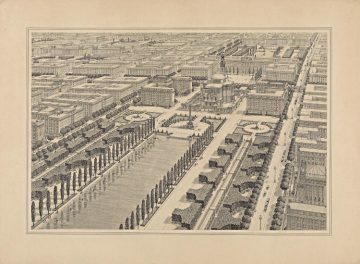 Otto Wagner (1841-1918) revolutionized architecture with his aesthetically pleasing yet functional buildings designed for a rapidly expanding city. His designs ranged from private villas to apartment blocks and churches. Two of his best-known designs in Vienna are the Post Savings Bank and the Karlsplatz Stadtbahn Station. 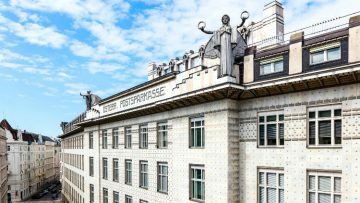 Otto Wagner in the Wien Museum is the first major exhibition of this major architect’s work in half a century. Sketches, models, furniture, painting and personal effects will be on display. 15 March to 7 October 2017 in the Wien Museum. Wagner, Hoffmann, Loos and Furniture Design in the Viennese Modernism. Artists, Patrons and Producers. This exhibition focuses on the interior designs and furniture designed by the three leading architects, as well as other Viennese Modernism furniture makers. Wagner, Hoffmann, Loos und das Möbeldesign der Wiener Moderne. Künstler, Auftraggeber, Produzenten. 21 March to 7 October 2018 in the Imperial Furniture Collection (Hofmobiliendepot). The exhibition explores the impact of Otto Wagner as father of the modernism on his contemporaries. 30 May – 30 September 2018 in the MAK. 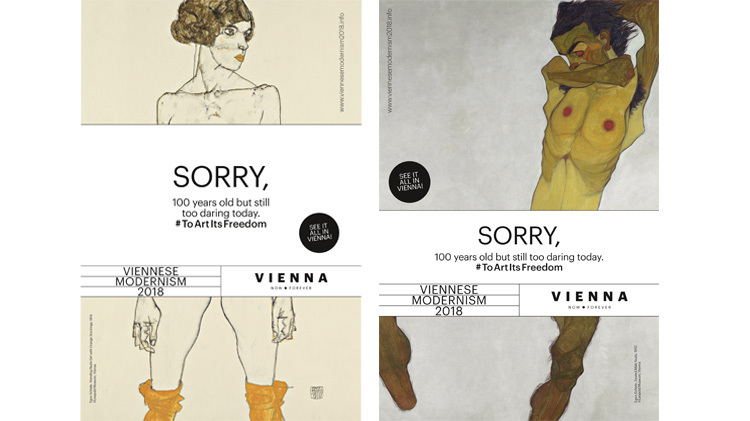 In addition to the Beauty and Abyss themed exhibitions, Vienna will have a wide variety of further temporary art exhibitions during the winter of 2017/2018 and the rest of 2018. The permanent collections of Vienna’s top museums also have marvellous treasures such as Klimt’s The Kiss, the Tower of Babel of Bruegel and a feather headdress from Mexico.